There are two hanging patches to KWin/KWayland (D1230/D1231) that add support for remote access via passing GBM file descriptor with Wayland messages. Unfortunately they are not compatible with most remote access implementations. To address this the PipeWire glue layer should be created. This task tracks progress in implementing such protocol from the ground up. All questions/clarifications regarding PipeWire support also go here. Kanedias triaged this task as Normal priority. Kanedias added a parent task: T5653: [kwin] Screen recording in Wayland session. My suggestion in T5653 was to use a KDE daemon to proxy client requests and the conversion of GBM buffers to buffers suitable for PipeWire, but @davidedmundson said that he would prefer a process spawned by KWin for that. This would have security advantages in his opinion. KWin spawns on launch a separate process, that listens to client requests over D-Bus (this interface is not shared with GNOME, but can maybe be aligned with it). When at least one client requests screen capture, the process asks KWin for GBM buffers via the Wayland interface from D1231. KWin delivers them via the same interface to the process. The process does a conversion to PipeWire ready buffers and sends them to all interested clients via PipeWire. The process does this as long as at least one client is still interested in screen capture. Yeah, sounds good to me. I had some concerns with kded as it's already quite heavy with features. I'll try to come up with smth in a week or so. @Kanedias if you can make a small test app that acts as a client side and fetches a buffer (what you already have in krdc, but standalone) and put that somewhere, that would be awesome. Then maybe I can hook up DBus and possibly pipewire from there. It'll split the workload. do_winsys_init: DRM version is 3.19.0 but this driver is only compatible with 2.12.0 (kernel 3.2) or later. Yeah... it works! Fixed last error by using render node instead of messing with DRM Master. Tested on amdgpu Radeon RX480, Mesa 17.3. Is someone already doing anything on top of this? I'm about to start hooking up PipeWire, post here in case something's just around the corner. Not yet, but I plan to look into it tomorrow and attend PipeWire hackfest on tuesday so there might be some progress from my side. I need to work on some other stuff until FOSDEM, but I'm definitely following your progress and I hope we can maybe afterwards come up with some meeting on IRC or a video call where @jgrulich can give a small report regarding the PipeWire hackfest. This would be a question @jgrulich could ask at the hackfest. Maybe there is already a lib to provide something like this planned by the PipeWire devs. I don't honesly think that Wim (= PipeWire devs) will work on something like this, there is plenty of work on PipeWire missing and given that people around are Gnome devs, there is no need for a C++ wrapper, at least for them. We can then have a meeting on IRC if there will be anything to share or I can send it here. I attended a small hackfest we had with Wim, Firefox guys and a guy from our team who will add Pipewire support to webrtc (for browser support). Wim told us what is the best approach to support Pipewire. Up until now Gnome applications used some Mutter interface, returning a file descriptor which then they used through Pipewire and get the content. Now there is support for this in xdg-desktop-portal, which was intended to be used for sandboxed apps but there is plan to use it even outside sandbox. This means that for applications we can use org.freedesktop.portal.ScreenCast interface and with this it will work for sandboxed and non-sandboxed applications. On the otherside to have support for KWin → Pipewire we need to implement backend part for xdg-desktop-portal, specifically in xdg-desktop-portal-kde. Also applications using Pipewire directly (not using xdg-desktop-portal) will work as well, because there is plan for Pipewire to internally call the portal if user specifies to Pipewire that he has interest in screencast. For the backend we have to implement similar interface. I already started working on this. My plan right now is to add this, write a simple example which will pass some random video (there is an example in pipewire) to test the portal backend and add also a test to my xdg-portal-test-kde application to attempt to consume a stream using this portal. Once this is done and working we can attempt to get the real screen content as it's not possible to do this when you have nothing to test this with. Result of this should be a consistant way how to support screencasting, which will work for browsers and all applications using Pipewire directly or using xdg-desktop-portal. One solution for all. That's pretty much how I envisioned it. Latter has its advantages as you'd have one KWRR per client keeping it simpler and it keeps the auth in one place. Thanks for that source sample. Looks exactly what I was after. Personally I'd just use low level C, writing a wrapper means you have to maintain a whole wrapper..and have the code you need to write anyway and it's a nice modern C lib. I might have some time this weekend, but maybe you'll beat me. Right now I start KWRR manually, didn't integrate it with KWin codebase yet. Doing KWin → (KWRR → Pipewire) → xdg-desktop-portal-kde should work, problem is that from xdg-desktop-portal-kde you still need a way how to tell kwin what window/screen we need. In xdg-desktop-portal-gtk (gnome) they use org.gnome.Mutter.ScreenCast interface, which is similar to org.freedesktop.Portal.ScreenCast interface (obviously as mutter had this first and then they moved it to xdg-desktop-portal) and that interfaces returns fd. With this approach, which means having KWRR, we either need a way how to talk to KWRR and ask for what we want or directly talk to Kwin, which will ask KWRR do the pipewire stuff and KWRR returns fd back to KWin and Kwin returns it back to the client or xdg-desktop-portal-kde. Guys, in case everyone misses me I'm on vacation right now, will be back by weekend. I have all the portal logic done, if you want to look at it I have it in a branch "screencast" in xdg-desktop-portal-kde. Only missing part is return Pipewire node_id back through the portal, for that we need the daemon done. There is also a minor blocker for us in Pipewire (master). Wim already fixed issues regarding Pipewire and C++ in master, we can now build it without "-fpermissive". @jgrulich , I think I found a way to make KWin send only needed buffers to support >1 monitor setup. The remote access protocol sends buffers for all outputs bound by the client. you can wait for all outputs to be announced and collect them. Then, after the user confirms its selection you bind the specified output and kwin starts sending you buffers associated with it. 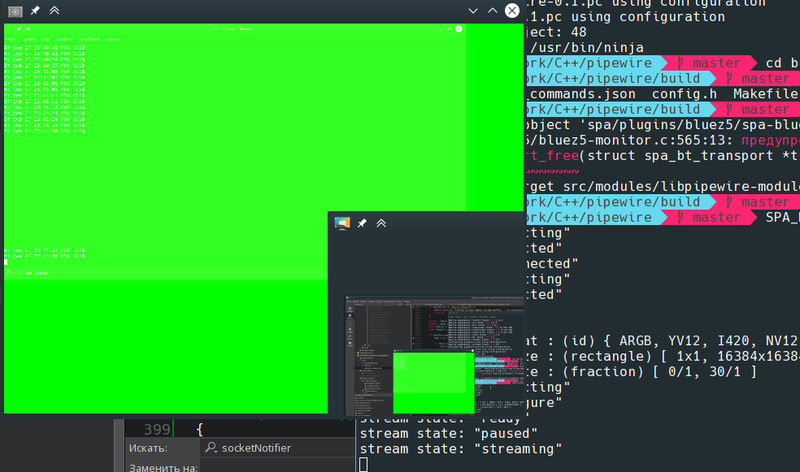 @jgrulich , were you able to connect the stream to pipewire with the code from xdg-desktop-portal-kde? It says only "Stream stage changed: connecting" and then "protocol-native: got connection error" to me. @Kanedias, yes, I can connect with that code, you need pipewire running to be able to connect. I use it the same way mutter uses pipewire. Ok, guess I'm missing something then, I'll take a closer look, thanks! Btw. this makes sense and should work in my opinion. Once I find a way how to pass buffers to pipewire streams I will change it to get screen cast for specified screen. I have been finally able to stream data from KWin through xdg-desktop-portal-kde and receive them with xdg-portal-test-kde. There are still issues like to select just one screen which should be recorder or initialize pipewire stream based on screen resolution. Right now it streams content from all screens and has hardcoded resolution to 1920x1080, but basically it works. I will keep polishing that and implement missing functionality tomorrow or so. I'll be researching crashes in GBM handlers you mentioned then. Can't make it crash, unfortunately. @jgrulich , seems I need some cooperation to make it reliably fail, let's compare our specs. Can you share your specs and steps? pw_remote_destroy - calls free(remote->error) even if it's not initialized, is this a bug?.. Can you try new version on your Fedora 27 laptop? Next thing I'd be suspicious about is two GPUs, didn't have this setup. Also, I really hope card KWin takes from logind and /dev/dri/renderD128 belong to the same GPU as for now this render node is hardcoded in screencasting impl. I'll be pushing changes with removing GSource and rewriting it with QSocketNotifier to kwin-remote-receiver, you can take a look if interested. I think I know what's the problem with delete output. In KWayland in output.cpp: WaylandPointer<wl_output, wl_output_destroy> output. While this is technically correct it shouldn't destroy output right away. It should call wl_output_release that will notify destruction to the server so it will know this client has no more bound outputs and RemoteAccess interface and stop sending buffers. @graesslin can you shed some light on this? I tried with Mesa 17.3.6 which landed into updates yesterday but the result is still same. I think that the second graphics card is not used and active, that shouldn't be problem. Try doing it with this patch, helped on my side. @romangg , @davidedmundson , @graesslin , should we merge D1230 & D1231? D10965 for xdg-desktop-portal depends on this code. D10965, that enables xdg-desktop-portal-kde to talk to KWin via the remote access interface in KWayland. So an application is now supposed to talk via DBus to xdg-desktop-portal to initiate a video transfer and the backend code in xdg-desktop-portal-kde automatically takes up querying KWin for the GBM buffers, converts them to Gl (what process does this for xdg-desktop-portal-kde?) and sends them via PipeWire to the application. Is this correct? We don't need the kwin-remote-receiver utility anymore because this is in xdg-d-p-kde code, yes? Is xdg-d-p-kde only for video in this regard or can it also be a proxy for input (as in remote access)? Normal applications not in containers can use the xdg-d-p-kde interfaces as well, yes? Shouldn't be needed, unless you want to avoid using xdg-d-p-kde. For remote access there is remote desktop portal, I proposed it to GSoC as a task. Yes, this is supposed to work for both sandboxed and non sandboxed applications. Also if an app is using Pipewire directly, then Pipewire will call xdg-d-p anyway, at least that's a plan for Pipewire I've heard from Wim Taymans when we spoke about it. I'll be on PTO since tomorrow to Saturday so if you have any other questions I will answer them later. Kanedias mentioned this in R108:51a6402ad55a: Implement remote framebuffer for GBM backend. Thanks for the answers. Sounds fine to me. Not sure if we only want to support the portals stuff and by that indirectly make it a standard in a broader sense, but if it works fine for everybody and there are no other solutions available, I'm certainly not against it. Xdg-desktop-portal-kde does it on its own, same way like kwrr (I actually took that part from kwrr). Kanedias mentioned this in R108:4d46edd7ba4b: GBM remote access support for KWin. This finally is ready to proceed, thanks everybody. D10965 to go. I'll begin working on KRfb integration with pipewire stream this week. We should think about input support as now remote sessions are limited to view-only. Can the remote access protocol be extended in this way? It would make sense by its name to facilitate remote input support here as well. Sure, we can, but I was thinking more about fake-input protocol as it's already in KWin, kde-connect uses it to control the desktop remotely. The problem is Pipewire integration, should we create ancillary stream for control? Does Pipewire support this? How does Mutter implement remote control? It's just food for thought for now, we can think more of it when KRfb patches re-emerge. As I mentioned to @Kanedias on IRC, there is also remote desktop portal which I proposed as a GSoC task, see https://community.kde.org/GSoC/2018/Ideas#Project:_Remote_desktop_portal. If there is no student who would like to work on it then I will implement it myself. bshah edited projects, added Plasma (Plasma 5.14); removed Plasma (Plasma 5.13). What's the status of this? Screen sharing works just fine with Plasma 5.13 and upcoming Plasma 5.14. There was a major issue in KWayland which will be fixed in KF5 5.51 so we might want to mention this to anyone trying screen sharing on Wayland. We still need some work to be done on KWin side to be able to share just a window, but this is not implement even in Mutter yet. I also still have to finish remote desktop support, which I didn't make to Plasma 5.14, but it will definitely be in Plasma 5.15. 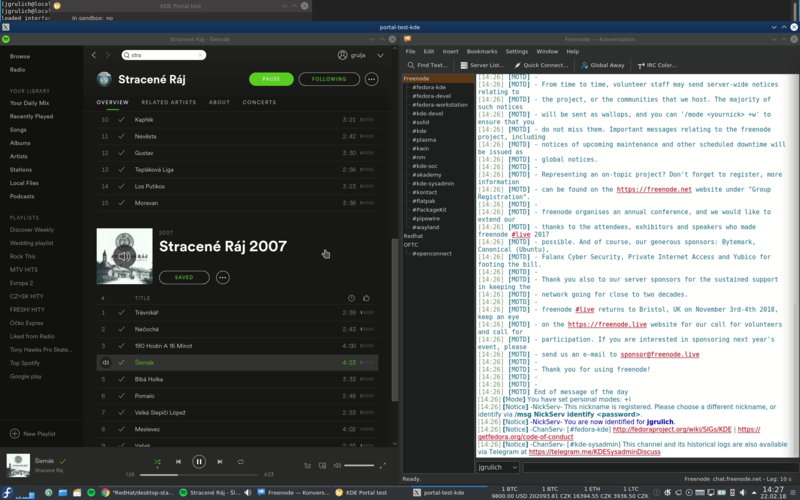 I did lots of rewrites in xdg-desktop-portal-kde recently and you can also get screen sharing done through remote desktop portal now. I also did changes in Krfb to support new PipeWire API and to use remote desktop portal to get screen content. What is missing is to handle input in Krfb and pass it to remote desktop portal in xdg-desktop-portal-kde where I miss to forward them to KWayland, this is still all in progress.